The steady progress of the previous season meant that the Star started the 1989/90 season with expectations of further progress. However, the league campaign started slowly as the Star did not manage a league victory until January. Relegation may well have been mentioned in some quarters. In the end though, the Star finished fourth from bottom, but were well clear of any relegation threat after securing seven victories in the second half of the season. The Star reserved their best performances for cup competitions. In the Scottish Junior Cup, a second round tie away to current holders Cumnock was perhaps not the best draw, but a goal in the last few minutes from Tony O'Hara gave the Star victory. Further late winners were grabbed in subsequent rounds in visits to FC Stoneywood and Lochee United before the Star succumbed to Whitburn after a replay in the fifth round. Four cup wins more than made up for the disappointment of the Scottish Junior Cup though. The Skol League Cup was secured against Bo'ness United with goals from Mark Ballantyne and Paul Ramsay. Poor Bo'ness United were to lose two further cup finals to the Star within a few days in June in the Fife & Lothians Cup and the Peter Craigie Cup. The week of silverware was concluded with the Star's fourth cup final win against Linlithgow Rose, a team the Star had never beaten in a cup final before having lost the previous eight finals. By this stage in a long season the Star had very few fit players, so much so that reserve goalkeeper Mike Meechan was being used as an outfield player. He, like the rest of the team, played their part in securing a 4-2 victory and a wonderful bounty of four cups sat nicely in the Victoria Park trophy cabinet. Bathgate Thistle H 1 2 Wilson Carswell, Coughlin, Fraser, Lumsdaine, McColl, Wilson, O'Hara, Parkin, Ramsay, Mitchell, Ballantyne. Subs: Cockerell, Prior. Bo'ness United H 2 2 Mitchell, O'Hara Carswell, Coughlin, Fraser, Wilson, Richardson, O'Hara, Prior, Mitchell, Ballantyne, Cockerell, Dall. Subs: Ramsay, Brown. Bonnyrigg Rose H 2 0 O'Hara, Prior Carswell, Coughlin, Fraser, Parkin, McColl, Richardson, Lumsdaine, Prior, Dall, O'Hara, Banks. Subs: Ballantyne, Wilson. Camelon Juniors H 3 1 Ramsay, O'Hara, Ballantyne Carswell, Coughlin, Banks, Brown, Richardson, McColl, Lumsdaine, Finlay, Ramsay, O'Hara, Ballantyne. Subs: Wilson, De Gaetano. A 7 1 Robertson 2, Ballantyne, Parkin, O'Hara, Finlay, Richardson Carswell, Wilson, Fraser, Parkin, McColl, Richardson, O'Hara, Finlay, Robertson, Ballantyne, Dall. Subs: Brown, Lumsdaine. A 0 0 Carswell, De Gaetano, Fraser, Finlay, McColl, Richardson, Dall, Prior, Ramsay, Ballantyne, O'Hara. Subs: Mitchell, Brown. Fauldhouse United H 4 1 ? Linlithgow Rose H 1 1 ? A 1 4 ? Carswell, Finlay, Fraser, Prior, Wilson, Richardson, Dall, McColl, Ramsay, O'Hara, Ballantyne. Subs: Lumsdaine, Banks. Ormiston Primrose H 3 0 Robertson 2, Ramsay Meechan, Coughlin, Banks, Lumsdaine, McColl, Wilson, Robertson, Parkin, Ramsay, O'Hara, Dall. Subs: Brown, Trialist. A 2 1 Ramsay, Parkin Carswell, Wilson, Fraser, Lumsdaine, Prior, McColl, Banks, Parkin, Ramsay, Ballantyne, O'Hara. Subs: Robertson, De Gaetano. A 1 1 Richardson Carswell, Wilson, Fraser, Parkin, McColl, Richardson, Dall, Prior, Ramsay, Ballantyne, Cockerell. Subs: Mitchell, Lumsdaine. 5 A Whitburn Juniors 1 1 McColl Carswell, Coughlin, Fraser, Lumsdaine, McColl, Richardson, Parkin, Prior, Ramsay, Banks, O'Hara. Subs: Ballantyne, Dall. H Whitburn Juniors 2 5 Wilson, Prior Carswell, Coughlin, Fraser, Parkin, McColl, Wilson, Dall, Prior, Ramsay, Ballantyne, O'Hara. Subs: Banks, Lumsdaine. 1 A Glenrothes 2 0 Ramsay, Dall Carswell, Coughlin, Mitchell, Finlay, McColl, Richardson, Brown, Parkin, Ramsay, Dall, O'Hara. Subs: De Gaetano, Cockerell. 3 H Kelty Hearts 5 0 O'Hara 2, Ramsay 2, Parkin Carswell, Wilson, Fraser, Richardson, McColl, Parkin, Dall, Lumsdaine, Ramsay, Banks, O'Hara. Subs: Prior, Robertson. QF A Preston Athletic 3 1 McColl 2, Ramsay Carswell, Wilson, Fraser, Lumsdaine, McColl, Richardson, Finlay, Brown, Ramsay, Ballantyne, O'Hara. Subs: Robertson, Parkin. SF N St Andrews United 2 0 McColl 2 Carswell, Wilson, Fraser, Lumsdaine, McColl, Richardson, Dall, Parkin, Ramsay, Ballantyne, O'Hara. Subs: Brown, Banks. F N Bo'ness United 2 0 Banks, OG Carswell, Wilson, Fraser, Lumsdaine, McColl, Richardson, Finlay, Parkin, Ramsay, O'Hara, Ballantyne. Subs: Brown, Banks. 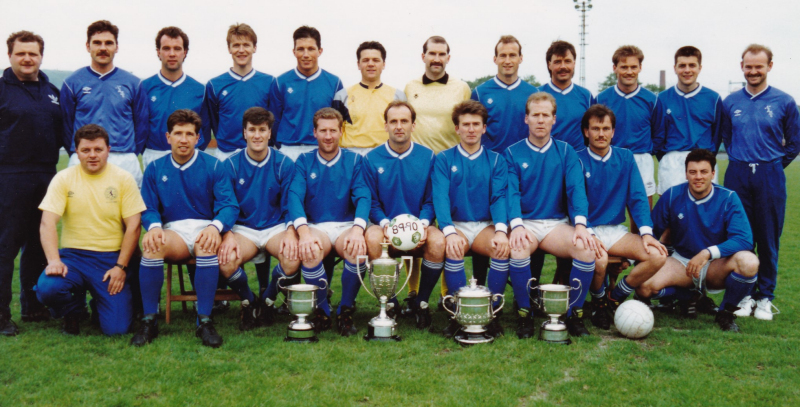 Super Newtongrange Star won their second cup final of season 1989/90 last Friday at Linlithgow’s Prestonfield and again their luckless victims were Bo’ness United whom they beat in the Skol League Cup final by 2-1 in November. 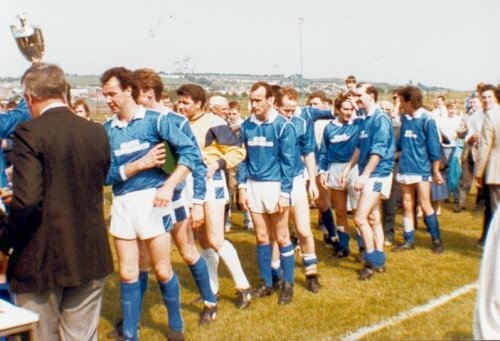 This time, however, it was the top Fife and Lothians Cup final, which Star also won in ’88 at Prestonfield, but in 1990 Newtongrange beat their West Lothian rivals by 2-0 to lift cup number two! The Star’s league season may have been mediocre but they are cleaning up on the cup front with two cup finals down and this week two more to go! It was sad, however, that Stewart Dall didn’t make the final due to his injury sustained against Ormiston but Robert Finlay took on the number 7 jersey in an otherwise unchanged Star line-up. Bo’ness had put out holders Edinburgh United and with a big support were expecting to do well. And United were quickly on the offensive finding gaps in an unusually unsteady Star defence but lady luck smiled on the Midlothian men as United’s finishing was woeful. Bo’ness had more composure but in the ninth minute Gordon Fraser rescued a dithering Kevin McColl with a superb tackle as winger Gary Dalton rushed in on Carswell for the kill. Gordon Wilson replied for Nitten with a long range effort as with 15 minutes played the Star looked slightly better. But Bo’ness created more chances and contrived to miss them as with George Allison in 19 minutes unable to make contact in front of goals from a perfect Eric Ewing cross. Five minutes later Allison passed up another chance before Fisher fired a vicious effort just too high. At times the Star were just hanging on with Dall’s runs missed and the midfield looking cumbersome. It was fully 34 minutes before we saw some real Star action when first Paul Ramsay sent in a low shot that troubled Kirkwood with the bounce but then a Ramsay/Craig Lumsdaine combination set up an opening for ‘Roger’ to hit a brilliant effort inches over. In 39 minutes a miskick by Fraser put Dalton clean through but again the number 7 drove wide – much to the Star’s relief and Bo’ness’ dismay. So Newtongrange had scraped through a lean first half but boss John Buckley pulled off injured Lumsdaine and put on substitute Alan Banks for the second half to try to liven up things for the Star. Bo’ness however still had a firm grip of midfield in second half and most of the traffic continued going towards Alan Carswell in the Star’s goal. The keeper had a superb save in 59 minutes when he denied a Fisher rocket shot destined for the net at the last minute just tipping the ball for a corner – a real cup winning save! Bo’ness’ lack of success at finding the net despite creating numerous chances and having almost three quarters of the game made their large support restive as a catalogue of errors on both sides reduced the quality of the play expected in a top cup final. Injured Robert Finlay was replaced by Stef Brown however in 69 minutes in a bold attempt to break the deadlock and just five minutes later it did the trick! With 16 minutes to go Mark Ballantyne swung over a corner from the left and Alan Banks rose like a bird to head home a vital goal out of nothing in off the underside of the crossbar – a crushing blow for desperate United. Brilliant performances from Kevin McColl and Stevie Richardson were the foundations of Newtongrange’s cup final victory as they continued to frustrate Bo’ness who persisted in trying the high ball in to the Star area but without success. The icing on the cake and the final nail in the Bo’ness cup final coffin came in the very last minute when the Star sealed the cup final with a second strike. But it was all thanks to Bo’ness who having spent the whole night failing to find the net at Nitten’s end – contrived to score an own goal in their own net! 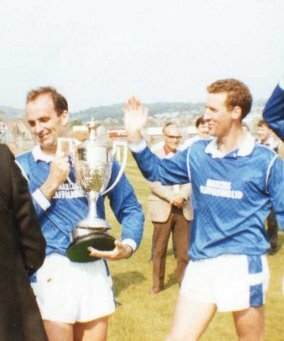 In 89 minutes Alan Banks swung over a free kick from the left and Fisher stabbed the ball into his own net to complete a miserable night for Bo’ness, giving Star a 2-0 cup final victory. It certainly wasn’t a classic cup final by any means but with a little rub of the green and powerful performances from Carswell, Fraser, McColl and Richardson in defence it was a smash and grab cup final. Newtongrange Star: Carswell, Wilson, Fraser, Lumsdaine, McColl, Richardson, Finlay, Parkin, Ramsay, O'Hara, Ballantyne. Subs: Brown, Banks. Bo'ness United: Kirkwood, McLennan, Cheape, Purdie, Malloy, Fisher, Dalton, Ewing, Dawson, Allison, McLauchlan. Subs: Dunlevie, Davidson. 1 A Tranent Juniors 2 2 Parkin, Brown Carswell, Coughlin, Fraser, Parkin, McColl, Richardson, Ballantyne, Brown, Ramsay, Finlay, O'Hara. Subs: Cockerell, De Gaetano. QF H Edinburgh United 2 0 Brown, Parkin Carswell, Coughlin, Fraser, Richardson, McColl, Parkin, Brown, Lumsdaine, Robertson, Banks, Dall. Subs: Ramsay, O'Hara. SF H Ormiston Primrose 1 1 ? A Ormiston Primrose 3 2 Ramsay 2, Robertson Carswell, Wilson, Fraser, Parkin, McColl, Richardson, Robertson, O'Hara, Ramsay, Banks, Ballantyne. Subs: Meechan, Brown. F N Linlithgow Rose 4 2 Robertson, Ramsay, Parkin, O'Hara Carswell, Wilson, Banks, Lumsdaine, McColl, Richardson, Robertson, Parkin, Ramsay, Ballantyne, O'Hara. Subs: Meechan, Brown. Unbeatable Newtongrange Star conquered Linlithgow Rose easily last Saturday to win the prestigious James Kerr Cup Final and finish the Juniors’ 89/90 season with no fewer than four of the East Region’s five cups to their credit to bulge the Star trophy cabinet to capacity – the complete envy of the other 25 junior clubs in the region! Star showed no signs of the tiredness expected of a team playing its 46th and last match of the season while the reputed ‘fresher’ Linlithgow Rose, idle for two weeks to prepare for the final were well beaten by a quality side which was excellent in every department. Playing their third cup final in eight days, Newtongrange were simply the best. Three cup finals down with one to go were Star going to be leg weary? Not a bit of it! For some reasons, Linlithgow were seven minutes late taking the field (gamesmanship or frightened? ), then three minutes later after a problem with the nets in Alan Carswell’s goals the match kicked off 10 minutes late. And, just eight minutes later the Star were 2-0 up and Linlithgow never recovered! Something of experts now in cup finals, the Star skipped the formalities and blasted Linlithgow away in a devastating opening burst. First in three minutes Chris Robertson spun round in the box to score from close in after Tony O’Hara had picked out Gordon Parkin with a right wing cross and Parkies header found the lurking number seven Robertson to score a goal in a hurry. A brief reply from Linlithgow ensued but in eight minutes it was 2-0. An Alan Banks free kick into the box found top scorer Paul Ramsay and while Paul’s first effort was blocked by Henderson, the number nine stuffed the rebound into the Linlithgow net. The Star were much friskier than the waiting Rose had expected and the Midlothian side continued to persecute a shambles of a Linlithgow defence. In 16 minutes Paul Ramsay was so unlucky with a 40 yard lob that just missed the target with keeper Henderson beaten then a minute later an indirect free kick awarded against Alan Carswell handling outside his box was blasted in by Rose’s Wilcox but it was blocked then cleared to safety. In 19 minutes keeper Henderson kicked an atrocious free kick straight to Tony O’Hara but he just slipped the ball wide. Big Malcolm Morrison (Linlithgow) was booked next for a foul on Craig Lumsdaine who himself had a positively brilliant cup final as the Rose’s attack in reply was powder puff stuff. 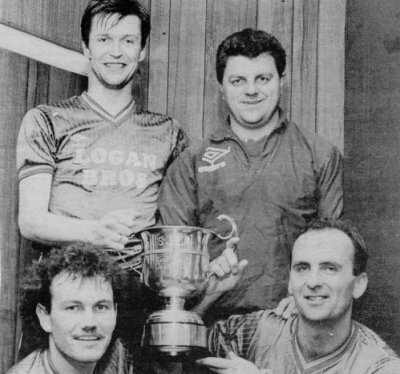 With Gordon Wilson, Kevin McColl, Stevie Richardson and Alan Banks in magnificent form in the back four Newtongrange were dominating the cup final – much more so than their previous three finals against Bo’ness! Newtongrange finished the first half the way they began with all out attack and Ballantyne and Lumsdaine forcing corners against a shell-shocked West Lothian defence. History making Newtongrange were already going into local folklore but there was still the second half to come! Noticeably Linlithgow were now first out this time and Newtongrange replaced injured Chris Robertson with super sub Michael Meechan. In the very first minute Parkin could have finally buried the Rose but his driven effort was blocked by Henderson for a corner. Any effects of a half time tongue lashing from Linlithgow coach Jimmy Crease were hard to find – that is until the fifth minute when McColl was just too casual and the Rose pulled one back through Halcrow who needed a second bite after Carswell had blocked the number 10’s first try. A minute later Linlithgow had no fewer than three players booked in succession, McGonigle, Halcrow and then Wilcox. Miller became the fifth Linlithgow player to be booked in the 55th minute as they forgot about the football. Star didn’t though and gloriously went 3-1 up in 57 minutes! Tony O’Hara fired over a free kick from the left and Gordon Parkin diving low down headed past Henderson for a superb goal. Around the hour desperate Linlithgow introduced both substitutes Kevin Gibson and Alan McNab as the Star were streets ahead. Any chance of a Linlithgow revival died when Stuart Purves was next sent off in 63 minutes reducing luckless Linlithgow to 10 men. Meechan almost beat Henderson with an excellent header next then a mazy run by Lumsdaine saw a brilliant Henderson save deny the number four. But with only three quarters of the game gone Newtongrange had the cup final won! In 66 minutes Tony O’Hara waltzed though to a fine ball to slam home Star’s 104th goal of the season to put the icing on the cup final cake and the slaughter was complete. Star could have had more goals – Paul Ramsay clean through was blocked by Henderson but with 10 minutes to go Lumsdaine went off to a huge reception with Stef Brown coming on. Parkin nearly made it five in 84 minutes but in the last minute Alan McNab scored a consolation goal for Linlithgow from a touch by David Blaikie. But that was it and on a beautiful sunny day the Star cup haul was complete and the history books rewritten. Salute Newtongrange Star for a feat second to none! And Saturday is the Newtongrange Gala Day! Newtongrange Star: Carswell, Wilson, Banks, Lumsdaine, McColl, Richardson, Robertson, Parkin, Ramsay, Ballantyne, O'Hara. Subs: Meechan, Brown. Linlithgow Rose: Henderson, Purves, Rae, McKeeman, Morrison, Wilcox, Hoggan, Miller, McGonigle, Halcrow, Blaikie. Subs: Gibson, McNab. QF A Arniston Rangers 5 0 ? SF H Edinburgh United 4 1 ? Star beat Bo'ness United for the third successive time this season in a cup final to become the scourge of Newtown Park. That was the final of the Peter Craigie Cup where Paul Ramsay had opened the scoring for John Buckley's team only to be pegged back to equality after half time by Bo'ness. However, in time added on for injuries, captain courageous Kevin McColl broke Bo'ness hearts yet again heading home the winner and appropriately Newtongrange's 100th goal of a wonderful season. A 5 0 Finlay, De Gaetano, Dall, Ballantyne, Prior Carswell, Wilson, Fraser, Finlay, McColl, Richardson, Cockerell, Prior, Ramsay, Ballantyne, Dall. Subs: O'Hara (for Cockerell), De Gaetano (for Wilson). Musselburgh Athletic H 3 0 Cockerell, Prior, Ramsay Carswell, Wilson, Fraser, Richardson, McColl, Finlay, Prior, Ballantyne, Ramsay, Cockerell, Dall. Subs: O'Hara, De Gaetano. A 4 2 Prior, Cockerell, Dall, McColl Ball, Wilson, Fraser, Richardson, McColl, Brown, Prior, Ballantyne, Cockerell, O'Hara, Dall. Subs: Ramsay, Mitchell. QF A Tranent Juniors 3 2 O'Hara, Parkin, Ballantyne Carswell, Brown, Fraser, Finlay, McColl, Mitchell, O'Hara, Parkin, Ramsay, Richardson, Dall. Subs: Ballantyne, De Gaetano. SF H Ormiston Primrose 2 0 Wilson 2 Carswell, Coughlin, Fraser, Lumsdaine, Prior, Wilson, O'Hara, McColl, Dall, Ballantyne, Ramsay. Subs: Mitchell, Cockerell. F N Bo'ness United 2 1 Ballantyne, Ramsay Carswell, Coughlin, Fraser, Brown, McColl, Wilson, Prior, Parkin, Dall, Ballantyne, O'Hara. Subs: Cockerell, Ramsay. Jubilant after their 2-1 victory over Bo'ness in the final of the Skol Cup are the players and staff of Newtongrange Star. Above, goal scorers Paul Ramsay (top left) and Mark Ballantyne (below left) are congratulated by manager John Buckley (top right) and captain Kevin McColl (below right). NEWTONGRANGE STAR lived up to their pre-match billing when they pulled back a 1-0 deficit to clinch the Skol League Cup with a 2-1 victory over Bo'ness United. "We said before the match," said Star Coach Ronnie Tolmie, "that Newtongrange were at their most dangerous when they're behind." When Star captain Kevin McColl handled Andy Dunlevie coolly put the favourites in front from the penalty spot. Minutes later United just failed to extend their lead when Jimmy Dawson shot wide of the left post. Bo'ness boss John Lapsley said: "If we had scored then I don't think Newtongrange would have come back." Instead, Dawson's miss and the introduction of substitute Paul Ramsay revived Star and ten minutes from the end Mark Ballantyne equalised. Eventually, Stuart Dall, epitomising Star's battling performance, broke through and passed to Ramsay who curled a shot past Gavin Kirkwood. Newtongrange Star: Carswell, Coughlin, Fraser, Brown, McColl, Wilson, Prior, Parkin, Dall, Ballantyne, O'Hara. Subs: Cockerell, Ramsay. Bo'ness United: Kirkwood, Dunlevie, Cheape, McLennan, McLean, Fisher, Dalton, Allison, Dawson, Wilson, ?. Subs: McLaughlin, Kneeshaw.